Mainland scientists are increasingly confident of developing the world’s first invisibility cloak, using technology to hide objects from view and make them “disappear”. The central government has funded at least 40 research teams over the past three years to develop the idea, which until now has largely been the stuff of science fiction and fantasy novels like the Harry Potter series. The technology would have obvious military uses such as developing stealth aircraft, but Beijing believes the research could lead to wider technological breakthroughs with broader uses, scientists involved in the research said. The teams involved include researchers at Tsinghua University and the Chinese Academy of Sciences. 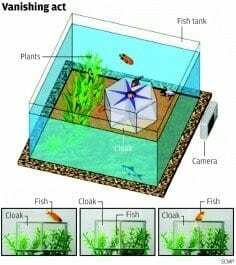 A team led by Professor Chen Hongsheng at Zhejiang University released a video last month demonstrating a device that made fish invisible. The same technology also apparently made a cat “disappear”. The device was made of a hexagonal array of glass-like panels, which obscure the object from view by bending light around it. Other mainland teams have made similar breakthroughs. Many other top universities and research institutes are also involved in invisibility studies in China. They include Chinese Academy of Sciences, Beijing Institute of Technology, Xian Jiaotong University, Harbin Institute of Technology, Tsinghua University and the University of Electronic Science and Technology of China. Some researchers declined SCMP’s request for an interview due to the military sensitivity of their research. A team at the Nanjing University of Aeronautics and Astronautics, for instance, was funded by the National Natural Science Foundation of China to develop “full invisibility” technology and material for hypersonic jets similar to NASA’s X-43A scramjet. The hypersonic vehicle could be used to delivered nuclear warheads around the globe with speed at least five times faster than sound. “We are invisible people studying invisible technology,” said a researcher involved in the project. Professor Ma Yungui, an optical engineering specialist at Zhejiang University, said his team would soon announce their latest finding: a device that stops objects being detected by heat sensors or metal detectors. Ma’s device is as large as a matchbox, but it could be increased in size to allow weapons to pass through security checkpoints. Another potential application is to stop agents or troops moving at night being caught by infrared cameras. “Many people have asked me if the technology can be applied on fighter jets so they can get heat-seeking missiles off their tail. Well, we may work on that,” he said. Ma said a useable and practical invisibility cloak might still be decades away as it needed super-materials that could not be produced with current technology, but the central government was still pouring funds into research because the theoretical knowledge gained could produce many potential spin-offs. April 6, 2019 - Shake off the invisibility cloak in Chennai The New Indian ExpressShanti Priya, a survivor of Parkinson's Disease, offers care, support and hope through her workshops. March 23, 2019 - Harry Potter Invisibility Cloak is coming, what should be made next? Wizards and What NotWe recently learned how a real-life Harry Potter Invisibility Cloak is being made, which is great, but what should be made next. April 16, 2019 - J.K. Rowling, who denies being a billionaire, made $54 million last year. Here's how the famous 'Harry Potter' author makes and spends her fortune. Business InsiderJ.K. Rowling is secretive about her fortune and has denied being a billionaire. Here's how the famous "Harry Potter" author spends her millions.